Reinhardt Central, located on the lower level of the Hasty Student Life Center, is your all-purpose stop for information about campus events and news. 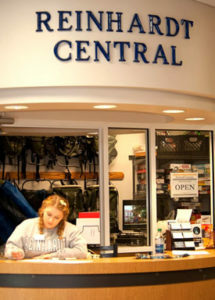 Reinhardt Central also offers a variety of camping and sports gear, as well as some classic board games for check out. All items are FREE to check out to all Reinhardt students, faculty and staff for a maximum of 3 days. A late fee of $25 is required for any overdue item. Our friendly student workers strive to provide students, faculty, staff, and visitors with helpful information about the campus and the community. And a variety of board games! Items are not to be left on the Reinhardt Central desk during closed hours; the individual is responsible for all items until properly checked in.